This Viennese Christmas Bread Recipe, also called Viennese Striezel, is an impressive three layer sweet bread studded with candied cherries and dried cranberries. Flavored with Cardamom and orange, I’ve used whole wheat flour rather than the traditional white flour to give it a nutty, country flavor. 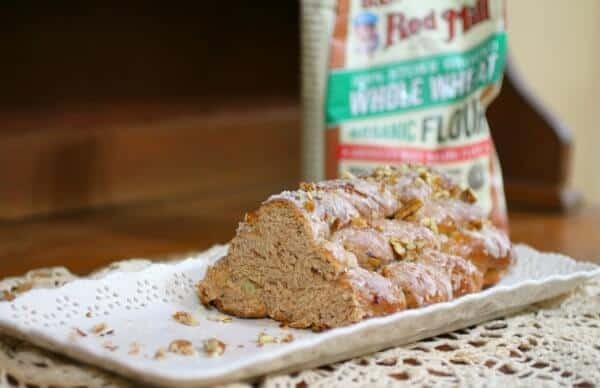 I was thrilled to partner with Bob’s Red Mill to create this recipe. I have used their products for years and have always been happy with the results. 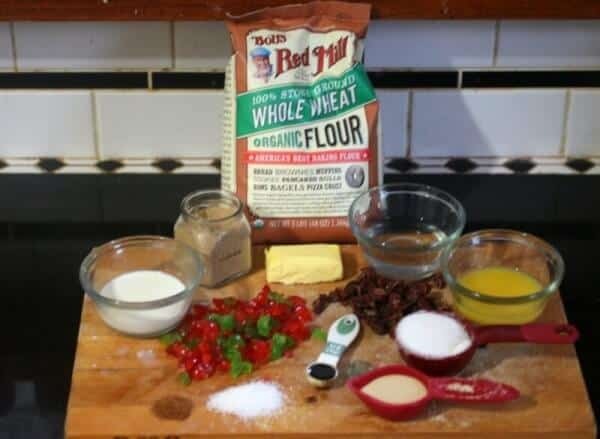 In fact, Bob’s Red Mill got started in 1978 and I think I started baking with the flour as soon as it became available in Texas. That means we’ve been “friends” for almost 40 years — actually my longest relationship to date! I love that it’s GMO-free and organic, too. I have always loved working with whole wheat flours and I often take traditional white flour recipes and convert them. Whole wheat flour not only adds that chewy texture and nutty flavor but it adds fiber, protein, and vitamins too. Most people run into the problem of heavy texture which usually means the flour hasn’t been kneaded enough. If you are kneading by machine it is going to take a good ten minutes and if you are kneading by hand it’s going to be more like 20 minutes of kneading. I’d also suggest that you use a little gluten flour along with the whole wheat flour — it will help the bread rise high and light and make the kneading process easier. Ingredients for the bread — I forgot the egg and the rum in the picture. Many of my memories of Christmas as a kid have to do with smells as much, or even maybe more, than sights or sounds. I can remember walking into our house after school in the dim winter light, my legs bright red from the cold (you wore dresses or skirts to school bach then no matter what) and feeling the blast of warm air scented with fruitcake or Christmas cookies. It was the only time of the year my mom baked and she usually baked fruitcakes for all of her siblings, our neighbors, the milkman, the postman, and people I can’t even think of right now. It was a generous time back then — something I think we’ve lost for the most part. Maybe it’s time to get it back? When I bake during the Holiday season I feel connected with all of those memories. It makes my house smell wonderful so when MY kids come in from school I know that they are making Christmas memories similar to mine so long ago, and it’s likely that they’ll make these same memories for their kids. It’s how the generations connect — memories and recipes. So, this Viennese Christmas bread recipe — perfect for giving! Perfect for making memories! European countries are known for their yeast breads and the sweet yeast breads that they create during the holidays are gorgeous. At least I think they are from the recipes I’ve tried and the images I have seen — I haven’t traveled to Europe yet, although it’s on my bucket list. Anyway, I think Austria has more of the Christmas bread recipes than some of the other countries — at least I’ve seen more. 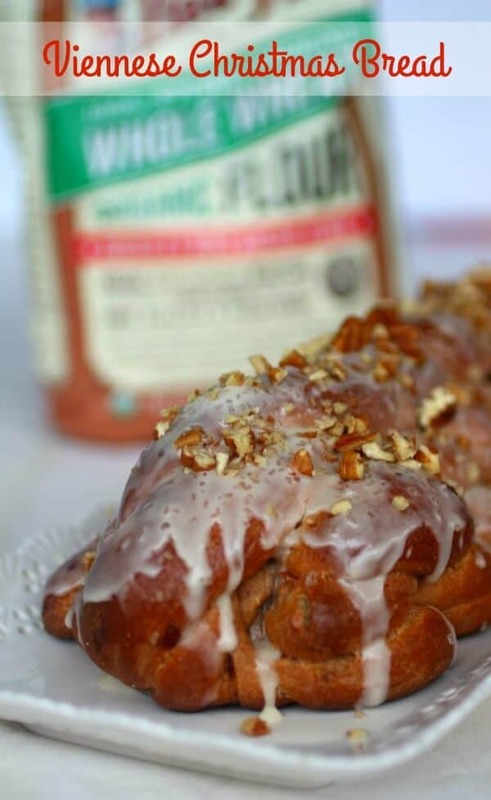 This Viennese Striezel is a braided Christmas loaf that really isn’t difficult to make. The dough is flavored with cardamom, orange, and just a hint of vanilla to give it a little extra sweetness. As I said, I’ve replaced the traditional white flour with Bob’s Red Mill whole wheat flour. I also used dried cranberries soaked in rum in place of the raisins in the original recipe which is in one of my go to vintage cookbooks, Farm Journal’s Homemade Bread, circa 1969. Believe it or not, I bought it at a used book store in 1975! It’s falling apart, stained, and has half the cover gone but I still use it at least a couple of times a month. 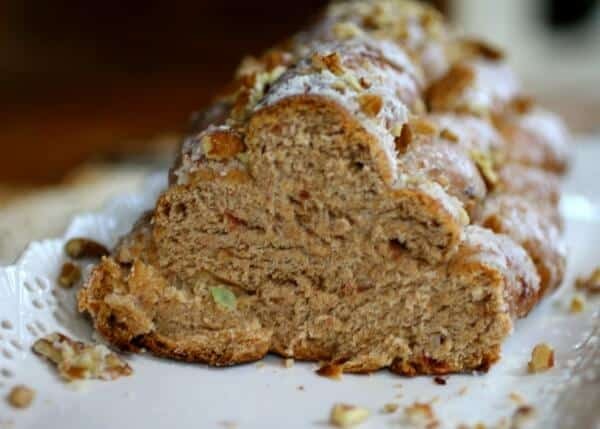 You’ll want to do this Christmas bread recipe on a day when you are going to be home all day because of the rising time (4 hours). Letting it rise overnight in the refrigerator is also an option. Braiding the bread makes for a pretty loaf and it’s easy to do. You’ll just need to divide the dough into nine pieces after the rising. Roll each into a strand about 15-inches long. Start with four strands and braid them loosely — it’s easiest if you start at the center and braid to each end. With the side of your hand make a dent down the middle of the braid. This helps the next braid to stay put. Take the next three strands and braid them loosely, starting at the middle and braiding to the ends. Carefully place it on top of the first braid and press gently. Now, make another dent down the middle of the second braid. 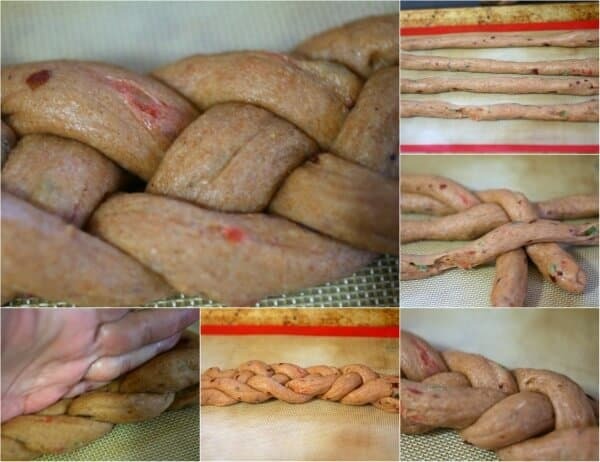 Take the remaining two strands of dough and twist them loosely around each other. Place on top of the second braid and press gently. Bring the ends of the last twist down over the ends of the loaf and tuck underneath. Using a scale is the easiest way to divide up the dough evenly. 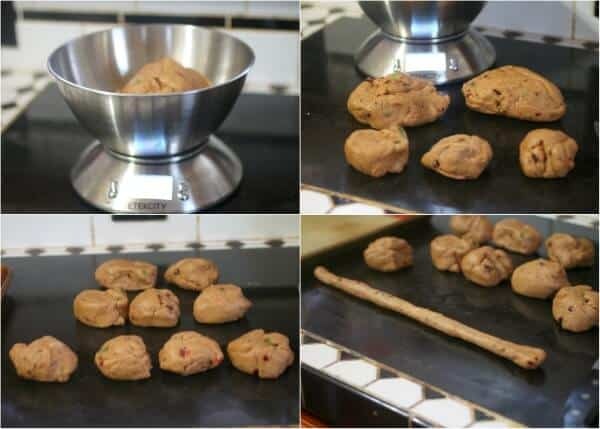 Roll each ball of dough into a rope. Begin braiding 4 strands from the middle to each end. Then create a dent down the middle with your hand. 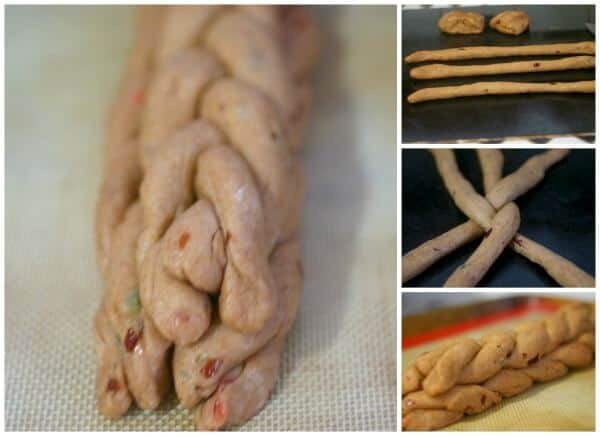 The second braid of the Christmas bread recipe is made of three ropes. Again, braid from the center to each end then lay it on top of the first braid, right in the dent. Press gently and then dent the top. The top braid is actually just two ropes twisted loosely together. Lay them in the dent of the second braid. Don’t dent the top. Now it’s ready for the second rise. 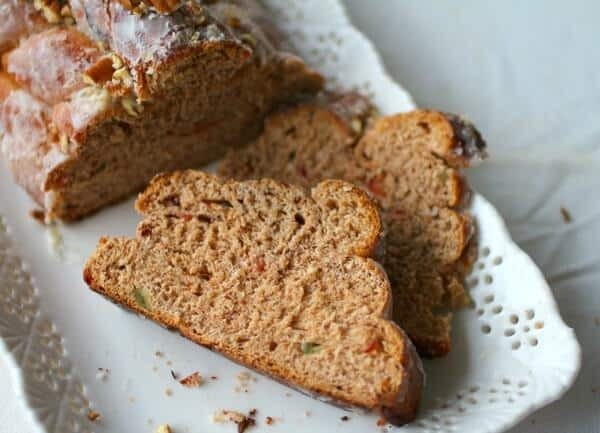 You are seriously going to love this Christmas bread recipe. It is a great gift, it freezes well, and it makes amazing French toast if you get tired of eating it with just butter. I like to give this in a basket along with a jar of orange marmalade and a tin of Vanilla Earl Grey tea. How about a Bob’s Red Mill coupon to help you get started? A whole wheat sweet bread with orange and vanilla flavors studded with candied cherries and dried cranberries is a welcome gift during the holidays. It makes the most amazing French toast ever. 1/4 cup melted unsalted butter cooled to 110F. Add the rum to the dried cranberries. Cover with plastic wrap and heat in the microwave for about 40 seconds. Add the water, ginger, and 1 teaspoon of sugar to the yeast. Add the milk, orange juice, sugar, vanilla paste, and egg to the yeast. Add the candied cherries and cranberries. Mix 1 cup of the flour with the vital wheat gluten, salt, nutmeg, and cardamom. Beat into the yeast mixture. 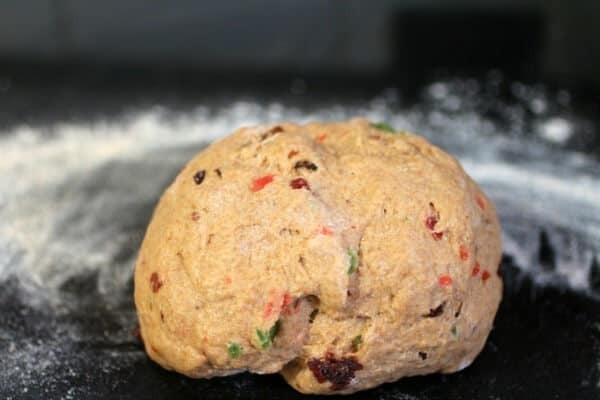 With mixer running, add enough of the remaining flour to form a soft dough that is easy to handle. It will feel tacky but not stick to your fingers. Knead according to manufacturer's instructions for about 10 minutes or about 20 minutes by hand. Give it a final kneading by hand on a lightly floured surface -- just a minute or two to make sure it's been kneaded thoroughly. Dough should be elastic but will still be slightly tacky to the touch. Place in a greased bowl, turn to grease the top of the dough, and cover with a clean tea towel. Put in a warm place to rise for about 2 1/4 hours -- or until double. Cover and let rest for 5 minutes. Shape into loaf or braid. Divide dough into 9 equal strands. Roll each into a strand about 15-inches long. Start with four strands and braid them loosely -- it's easiest if you start at the center and braid to each end. Let rise in a warm place 1 1/2 hours. While the oven is preheating brush the loaf with the egg glaze. Bake for 35 to 40 minutes, or until the loaf sounds hollow when tapped on the bottom. Cover with a towel while cooling if you'd like a soft crust. Mix the Confectioner's sugar and cream together to make a smooth, runny frosting. Spread on the top of the bread while it is still warm. What a pretty bread Marye! I love Vienna and all its beautiful and delicious pastries and breads. I’m excited to try this out! I bow to your advanced braiding skillz! I just made a batch of my Finnish Pulla (a cardamom-spiced braided sweet bread) and 3 strands is about all I can handle. I do fine on one side, but when I flip it around to start from the middle to the other end I . . . well it’s like doing something with my non dominant hand. Not simple and flowing! The flavors and the whole wheatiness of this bread sure are appealing. Thanks! What a special loaf! I love that you’d subbed in whole wheat flour for this too. Looks good! This would make wonderful food gifts for friends and family! Looks delicious! Thanks Taylor! It is definitely a welcome gift! What a beautiful cake full of my favorite flavors! How pretty this will be served at the holidays! Thank you! It is so pretty at Christmas Brunch! Looks AWESOME!! Is it ok to use just white or bread flour?? Yes, you can use white flour or bread flour! Thank you, Linda! You’re always making such delicious-looking breads! This is a perfect bread for the holiday! 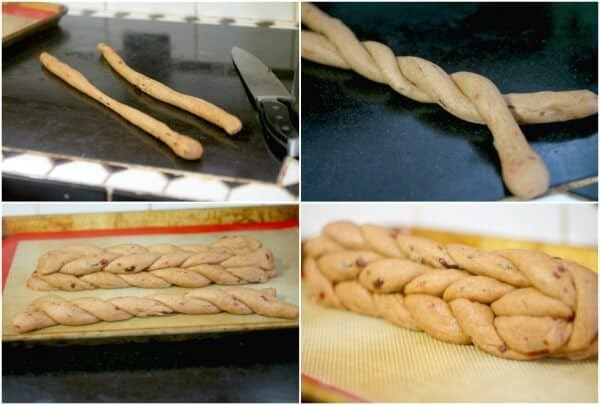 This is utterly amazing, nothing beats a braided bread when it comes to presentation. This is beautiful! This bread is gorgeous and I love BRM products! I have never heard of Viennese Christmas bread but it looks festive and fun to make. I am really digging the rum soaked cherries! Thanks Jennifer. It’s just so good! This bread sounds so perfect for the holidays. Love the rum, cranberries and orange in it! This loaf reminds my of growing up and visiting Grandma’s house where she would always have a Christmas loaf every year. I think her recipe came from her German parents. Brings back memories. Looks delicious! Magnificent Christmas Loaf, Marye. I love the braid work. I have only ever braided a loaf for Hawaiian sweet bread. Would love a slice of this at Christmas morning brunch! Absolutely! It’s wonderful for Brunch. I love special bread recipes like this for Christmas. Your loaf is gorgeous. A tripe decker braid is a little tricky but always looks spectacular!